Washington – When the Enfield Board of Education wanted to hold high school graduation ceremonies in a local church, the Connecticut American Civil Liberties Union sued on behalf of two students, arguing that doing so violated the First Amendment guarantees of religious liberty. The Connecticut ACLU won that 2010 case in the state’s U.S. District Court, which cited retiring U.S. Supreme Court Justice Anthony Kennedy in saying there must be a place for religion in a student’s life. There’s now a greater chance that cases like the one involving the Enfield Board of Education will be appealed to the Supreme Court. Even before President Donald Trump picked Judge Brett Kavanaugh to replace Kennedy, who is retiring from the high court, religious liberty cases like the one involving the Enfield Board of Education were on the rise at the Supreme Court. There’s concern Kavanaugh will speed the Supreme Court’s steady shift from a strict separation between government and religion and that his approach to religious liberty cases would determine the intensity of that trend for decades. Considered a “warrior of religious liberty” by some of his conservative admirers, Kavanaugh — who is Catholic — has defended the use of taxpayer money for religious schools and backed student-led prayers at high school football games, siding with religious interests when they conflict with government entities, according to a review of his rulings. In private practice, Kavanaugh served as chairman of the Federalist Society’s Religious Liberty Practice Group. In that role, he backed the government when it sought to support religious interests and challenged schools when they attempted to exclude religious groups. The ACLU in Connecticut has fought discrimination based on religion – a recent case involved the Connecticut’s Department of Correction’s refusal to provide a prisoner who practiced Santeria with the materials he needed for his worship. But Dan Barrett, legal director at the Connecticut office of the ACLU, said he’s concerned a more conservative Supreme Court with the seating of Kavanaugh will bolster the legal argument of “religious refusal,” the argued right to discriminate against someone based on religious reasons. That argument was at the heart of the Masterpiece Cakeshop v. Colorado Civil Rights Commission, in which a baker maintained he had a right, based on religion, to refuse to make a wedding cake for a gay couple. The Supreme Court’s 7-2 ruling handed a victory to the cakeshop by finding that its owner did not receive a fair and impartial hearing. “I think you are going to see, because of the Masterpiece case, similar cases in which a person who does not want to fulfill the requirement of a law will do so on the basis of their religion,” Barrett said. Kavanaugh has also argued fervently against the Affordable Care Act’s mandate that requires all employers, including religious ones, to cover their employee’s contraception. In his dissent in the 2015 Priests for Life v. United States Department of Health, Kavanaugh wrote that the mandate threatened to “substantially burden the religious organizations’ exercise of religion because the regulations require the organizations to take an action contrary to their sincere religious beliefs … or else pay significant monetary penalties.” The case was ultimately decided against Priests for Life. “I don’t think we could have asked for a better pick for religious rights,” Wolfgang said. He cited other cases, including Newdow v. Roberts, where Kavanaugh issued a concurring opinion in a challenge to prayers at the presidential inauguration and the inclusion of “so help me God” in the official presidential oath. 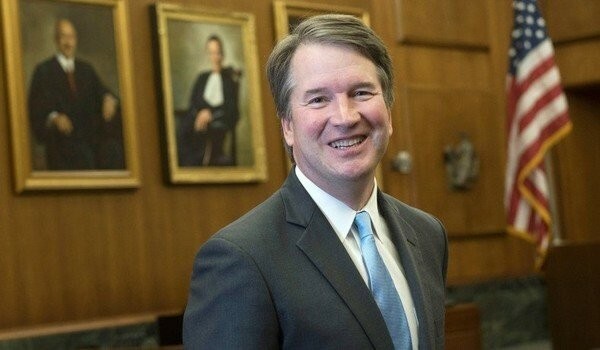 “We … cannot dismiss the desire of others in America to publicly ask for God’s blessing on certain government activities and to publicly seek God’s guidance for certain government officials,” Kavanaugh wrote. The other judges did not reach an opinion on the merits of the case and it was dismissed. Wolfgang also lauded Kavanaugh’s comments during oral arguments in a case that challenges the ban on religious advertising in the Washington D.C. subway system. Kavanaugh called the ban “pure discrimination” and “odious” to the First Amendment. In Archdiocese of Washington v. WMATA , the Catholic Archdiocese of Washington sued the D.C. Metro for rejecting a test advertisement the church tried to run before Christmas that included an image of the three wise men and promoted church attendance, focusing on Jesus and giving to charity. The ban on advertising was implemented because D.C. Metro officials were concerned that provocative advertisements, such as one depicting the Prophet Mohammed, could trigger vandalism and violence. The case is still pending in a federal appeals court, but could go to the U.S. Supreme Court. “This is an emerging area of the law,” Wolfgang said of religious liberty cases. Wolfgang cited as evidence of that “hostility” a failed attempt in 2009, to pass a bill that would have taken oversight of the state’s Catholic churches away from priests and bishops and handed that responsibility to a board of directors made up of lay parishioners. The bill was crafted after the former pastor of St. John’s Roman Catholic Church in Darien pleaded guilty in September of 2007 to stealing more than $1 million from the church and was sentenced to more than three years in federal prison. Connecticut chief justice nominee Andrew McDonald, then a state senator, sponsored the legislation. State Republicans voted in a bloc this year to derail McDonald’s confirmation. Meanwhile, Kavanaugh moved closer to his confirmation vote by submitting a 110-page questionnaire and another 2,000 pages of material to the Senate Judiciary Committee on Friday.